Copenhagen and Dubai, Emirates, a global connector of people, places and economies, announced today the launch of a daily A380 service to Copenhagen. As of 1st December 2015, the Danish capital will be the first in Scandinavia to boast a scheduled A380 service. The launch of Emirates’ A380 to Copenhagen, one of the most environmentally advanced aircraft in the sky,comes almost four years after the airline first linked the Danish capital with Dubai. The route will be served by the world’s first two-class configured A380, with a capacity of 615 passengers. With this new configuration, Emirates will offer a total of 8,610 seats a week between Copenhagen and Dubai. The aircraft also produces the lowest CO2 emissions per passenger kilometre of all commercial aeroplanes. “After launching the route with an A330, we witnessed growing demand for flights to and from Copenhagen, forcing us to deploy the larger 777 after only six months. Today, based on strong load factors, we are happy to further up-gauge the route to our iconic double-decker, the A380,” commented Sir Tim Clark, President, Emirates Airline. “Emirates is making history with this aircraft, its fuel efficiency is better than most modern small passenger cars in terms of fuel economy per passenger kilometre, allowing us to reduce emissions without compromising on comfort,” added Clark. Since its launch in August 2011, nearly eight hundred thousand passengers have travelled with Emirates on the Copenhagen-Dubai route. “We made significant investments to expand Copenhagen Airport and upgrade its facilities in order to make it A380-compatible. 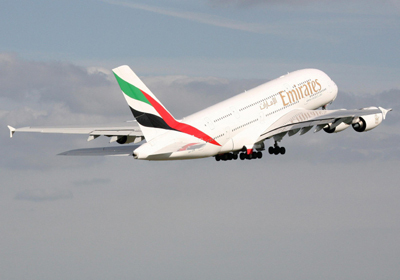 We are very excited about Emirates’ decision to deploy an A380, the world’s largest passenger aircraft, to our airport. Copenhagen will be the first in Scandinavia to offer a scheduled A380 service,” commented Thomas Woldbye, Copenhagen Airports’ CEO. “The additional capacity will help stimulate trade and tourism between Denmark and countries in the Middle East, Asia and Africa,” added Woldbye. The two-class configured A380 features 58 flat-bed seats in Business Class, 557 spacious seats in Economy Class, as well as access to Emirates’ famous Onboard Lounge where Business Class passengers can socialise at 40,000 feet. Passengers in all classes will also enjoy access to over 2000 channels of films, TV shows, music and games through ice, Emirates’ award-winning inflight entertainment system, as well as free Wi-Fi and gourmet cuisine. Emirates flight EK151 will leave Dubai at 0820hrs and arrive in Copenhagen at 1220hrs the same day. The return flight EK152 will depart Copenhagen at 1420hrs and arrive in Dubai at 2335hrs the same day. As with all Emirates flights, passengers will benefit from a generous baggage allowance of 30kg in Economy Class and 40kg in Business Class.